Desktop Screen Recorders act just like the print screen function but the difference is that it continuously records all your on screen activities just like a camcorder or digital camera. Oftenly sometimes the words are not enough to describe any Photoshop effect or any web application and Whether any new comer get introduced with your material then he should demand for a better describtion. Screencasts helps us for better describe a computer related product. There are many screen recording softwares available for you to record the screen activities. Here are few of the best screen recorders that will allow you to create videos and presentation from your activities and which are free to use. CamStudio is a open source software allows you several different options when it comes to the region of your screen being recorded. Choose Region from the Region dropdown menu and upon clicking Record, you will be able to draw out the square area you would like to see recorded. Choose Fixed Region and you will be able to enter numbers indicating possition and size of the desired screen recording area. Choose Full Screen and the whole screen will be recorded.This is one great software that you should definitely have to record your screen activities and create videos out of it. Free screen capture software Super Screen Capture is an all-in-one software for free screen recorder software. You can capture screen in many ways, including full screen capture, region capture, window capture, scroll capture, directx capture, video screen capture, audio capture and etc. You can choose many kinds of output ways, including clipboard, printer, email, editor tool, temp folder, and all popular formats. Super Screen Capture has an easy-to-use and intuitive interface. Whatever you can see on your screen, Super Screen Capture will easily and fastest screen recording for your immediate use. It will especially suit making demos, tutorials, and training videos. Freez Screen Video Capture is a screen-capture & screen-recording tool to record screen activities and sounds into standard AVI video files. You can record any part of the screen’s activities and the cursor’s movements, using a microphone to narrate your screen recordings. You can choose the output video’s compressor such as Microsoft Video 1, MPEG-4, DivXand many more, quality, framerate, audio format such as PCM, ADPCM, MP3, OGG and many more, and volumn. You can also start, pause, and stop screen recording with hotkeys. Free Screen Recorder is an easy-to-use screen recording program to capture screen activities and sounds to standard AVI video file. If you move the cursor, launch a program, type some text, click buttons, select some menus – anything you see on the screen – Free Screen Recorder will record all these, and sound from your system microphone. You can choose the output AVI file’s video codec, framerate, audio codec, frequency; You can choose the cursor’s display, to be actual cursor or custom one as you like, and you can add highlight to it. Record any part of the screen or even the entire desktop, with just a few clicks, or custom hotkeys. AutoScreenRecorder 3.0 Free is a completely free screen recorder to save your screen activities into video files. It is free for unlimited personal and business use. It has no expiration date and can be distributed with free of charge. You can also choose to buy a full fledged version of AutoScreenRecorder which adds in more features to the software like generating flash video files and recording voice and sound in the video. It is estimated that Macromedia Flash Player is installed in more than 90% of the PCs. Using Wink you can create content viewable across the web in all these users’ desktops. Similar applications sell for hundreds of dollars, while Wink is free with unrivaled features. It supports various output formats like .EXE, .FLV, .HTML, etc. The screen recorder is build with the old Rendersoft camstudio source, we didn’t wrote the whole thing ourself. UltraVNC Screen Recorder is based-on CamStudio source with updates to improve the performance.It just removed and added some code to make it faster. Windows Media Encoder is a powerful tool for content producers who want to capture audio and video content using the many innovations in Windows Media, including high-quality multichannel sound, high-definition video quality, and support for mixed-mode voice and music content. Windows Media Encoder 9 Series is the ideal tool for content producers who want advanced capture and compression for a wide variety of delivery scenarios. You can encode audio and video content in Windows Media Video (WMV) format using either the 32-bit version or the 64-bit version of Windows Media Encoder 9 Series. The version you choose will depend on your encoding scenarios. Krut is a screencast tool that is written in Java and well suited for making video tutorials (instructional videos) on most platforms. Krut records movie files, including sound, of selected parts of your screen. The files use the quicktime mov format. The program has an intuitive and compact user interface. In addition to a movie file, the program also records separate files for audio (wav) and video (mov), which easily allows encoding to any movie format using an external encoding program. BB FlashBack Express is the free version of some other advanced series. It can record from a video source, screen & audio.It can export to AVI or FLV & has integrated support for direct uploading to the popular video sharing websites. The BB FlashBack Express free screen recorder records from your webcam while it records your screen. Easy. The BB FlashBack Express free screen recorder has one-click upload to YouTube, Blip.tv, Viddler and Revver. These days recording screen activities have become quite a popular way of blogging and doing presentations. As above we have mentioned some of best free screen recoding softwares. No doubt that all they are known for their killing output but although if you are a professional and can spend some cash on your material for better quality. Then some of the best premium screen recoding softwares are described here. Screen Recorder Gold is an easy-to-use, fast, and powerful screen video recording software used for recording screen activities into standard AVI video files. Sound from your system microphone is also recorded. It is an ideal tool to make software demonstrations, develop videos for training and tutoring. Create effective training material in minutes. Try to make a software presentation and training video. For the movie I found the Screen Recorder Gold that works very good. It makes an AVI of my screen activities with a very good quality. If you choose ms video1 to compress the avi file, the file size will be smaller. Also you can record sound if you use it the right way. Screen recorder DemoCreator is a powerful yet simple screen recording software program for Windows. It captures the desktop activities, records what you say to the microphone and what you hear from the computer for further editing, publishes the screen recordings as compressed Flash movies or videos of popular formats to share to all. Create highly interactive learning content without the need of complicated programming knowledge. Easy Screen Recorder is a powerful record screen software for recording screen activities into AVI movies. With this useful program, you can create demo videos that record what’s happening on your PC desktop screen. It can record the entire screen, a window, a fixed region, or any part of the screen. Audio can also be recorded from any source, including microphone, line-in, or speakers. You can choose video and audio codec and quality. Record screen activities into compressed AVI files. Adjustable capture frame rate and playback rate. Can simulate the sound of mouse click and key press. Pan section automatically or manually while recording. 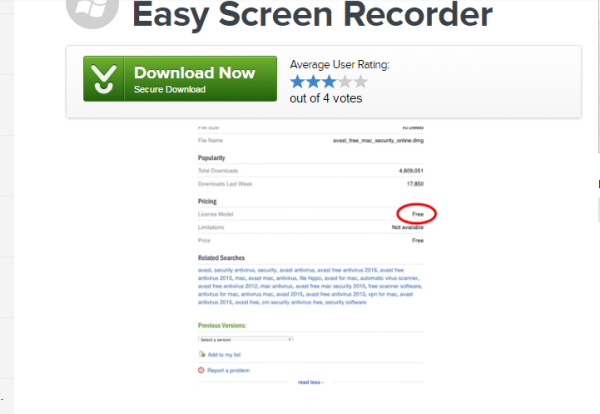 Easy Screen Recorder offers many features to make the demonstrations clearer. For example, it can add caption and timestamp, highlights mouse-click areas with colored circles and adds sounds on keystrokes and mouse clicks. It will especially suit making demos, tutorials and traning videos. If this post has missed any tool which you regularly use, please let us know via the comments. Thanks for reading, and I hope you will enjoy this useful experience. Great post, thanks for the sharing. I used to record my screen with acethinker free screen recorder, It’s a free web-based application that you don’t have to download or install anything, and it’s free as well. Share it here to increase the list. Great screen recorders. Great, Great. I am using Super Screen Capture. It is very good. I use BSR Screen Recorder 5 and it is the best. I remember seen a screencast, which displayed keyboard press as also on the screen if the tutorial auther pressed any key during screen cast. Anyone know which screen capturing program is that? Thanks for an elaborate introduction/review of almost all leading screen recorders. But I recommend one more screen recording software which is also freeware. Screen2Exe by StepOk Labs at http://www.screen-record.com/index.htm. This is the top in compressing the capture. It also has text annotation/zoom/import picture and now audio dubbing is included. Please check. Thanks for the reviews. In my view to record online video using flv recorder or webcam recorder will be faster and cheaper way of producing own video content. another vote for screentoaster and jing – i prefer jing for speed but both are great. Hmmmm….. in the paid arena Camtasia Studio (by Techsmith) and Captivate (by Adobe) were missed. Camtasia Studio is my fave. Thanks for the list of screen capturers. Unfortunately, you didn’t include my favorite, JING. Jing is free and it can best be identified as Camtasia Lite. You can record videos up to 5 minutes long and save it on the Screencast server for later use. Amazing… really pretty cool tool. How could you have not included the best screen recorder in the business, Camtasia Studio? (www.techsmith.com). It may not be free, but the title of your article does not say best “free” screen recorder. Seriously, if you need a top of the line screen recorder, you can’t do any better than Camtasia. i always use screentoaster.com. the quality is good enough for most applications and there is no installation required, works on any computer. also your video can be uploaded right away to youtube and to screentoaster’s own site.